Crunchy dehydrated kale chips are addictive, yet great for you. They are a much healthier option than deep-fried potato chips, but they can be expensive to buy at the store. You can make them at home easily and cheaply with your food dehydrator. Raw food enthusiasts can use a low-temperature method that yields a raw food product. 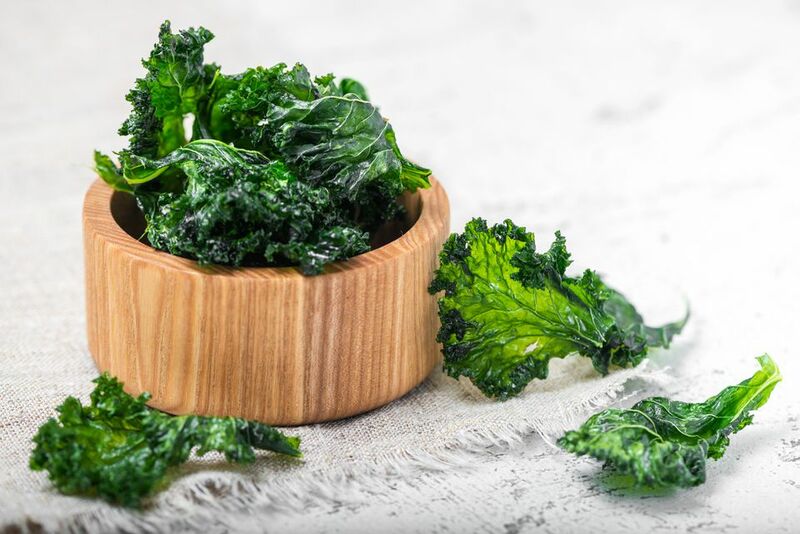 If you don't have a dehydrator, you can use the oven method to make kale chips faster or use a warm oven to dehydrate them. Be aware that the kale will shrink quite a bit during drying, so you can keep the pieces larger and make more than you think you will need. There are a couple of steps in making kale chips. The first is to prepare the kale. Then, you have a couple of choices in how you dehydrate them. To prepare the kale, strip the leaves away from the leaf stalks and tough midribs. You don't want to dry the whole leaves as the midribs end up with the consistency of twigs, and they are not tasty. Compost the leafstalks or save for soup stock. Wash the kale leaves and dry them well in a salad spinner or by gently rolling the leaves in a clean dishtowel. Tear the washed and dried leaves into just slightly larger than chip-sized pieces; they will shrink slightly as they dry. Toss the kale in a large bowl with the extra-virgin olive oil and the salt. Massage the leaves well with your clean hands. All of the leaves should be more or less evenly coated with the oil. If you like spicy flavors, add a dash of cayenne pepper. You could also add nutritional yeast for a cheesy flavor. Spread the leaves on the dehydrator trays in single layers. Do not crowd the leaves or they will not dry evenly. It is alright if the leaves touch, but they shouldn't overlap too much. This method doesn't result in chips that qualify as raw food, but the result is still very good and ready in half the time of the low-temperature method below. Dry the kale at 145 F/63 C for 1 hour. Reduce the heat to 115 F/46 C and dry for an additional 3 to 4 hours until crispy dry. Transfer to airtight containers, or vacuum seal for longer storage. Use this dehydrating step for your kale chips to be considered raw food. Dry the kale at 110 F/43 C for about 8 hours (overnight or while you're at work). Lactinato kale, also called dinosaur kale, is a bit harder to coat evenly with the oil but seems to keep its crunch longer once dehydrated. If your kale chips lose their crunch in storage, you can re-crisp them in a low (200 F/93 C) oven for 10 minutes, or in the dehydrator at 110 F/43 C for an hour. Some people prefer to dry the kale simply sprinkled with salt, without tossing it in olive oil or massaging the kale before drying. If you do so, you can sprinkle the kale with oil and season the chips after drying.